There's nothing like traveling to a different state or even country. I love soaking in all of the history plus the amazing views. 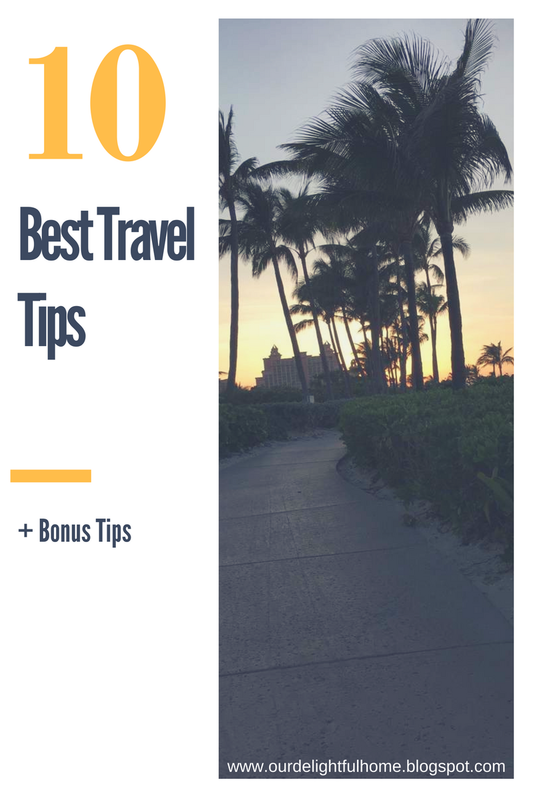 Today, I will be sharing some of my best travel tips. 1. Bring snacks. Always, even if you feel that you may not need them. I typically will pack honey granola bars. Especially when traveling with children. It just makes life so much easier. During our last trip to the Bahamas, I packed all types of snacks. It was our first time traveling alone so to speak and I wasn't sure when we would be able to get to food. This was also great when we woke up in the morning. We didn't have to rush to breakfast. 2. I always, always encourage people to carry travel size hand sanitizers with them. Yes, soap and water is the best. However, can you imagine how many germs are around? Yup, keep the travel size container in your bag and leave it there until you need it. 3. Making sure your electronics are fully charged. I always keep my chargers in my purse. Whether I'm on the plane or a car. My charger in arms reach. It's a great idea to invest in a portable charger just in case. 5. Keep an empty water bottle with you. Once you pass through security for your flight. You can fill your bottle (s) with water. This is especially a great idea when you have children with you. I typically do not drink too much juice these days. However, it's nice to have the flavor packs on hand for the kiddos. 6. I typically organize everything in clear zip lock bags. I like to keep my hygiene products in one, accessories, makeup, undergarments etc. I also like to put my outfits together in the Ziploc bags as well. This is such a great idea too for the kiddos. Having all of the outfits organized by the days of the week. I love that you can add the dates or color code it so the kids know which outfit they are wearing each day. It just makes life so much easier. 7. It's a great idea to recycle store bags and I typically will keep a few Target bags in my suitcases for soiled items and swimwear. 10. Try to avoid using the airport wifi for any serious business. We all know that wifi is a hackers glory spot. If you're just surfing the web to past time until it's time to get on your flight. That's one thing, however, do not put any personal information out there. What's your favorite Travel Tip? Thanks for all the tips. I also cannot leave the house without hand sanitizer. I learnt that rather quickly. I never thought about carrying an empty water bottle at the airport. This is a great tip! For me, I have to have a portable charger. It's a lifesaver. Awesome tips! I'll have to remember that water bottle one. I hate spending so much on water. I also always pack snacks. YES. These are great. "Bring snacks" is definitely on my list of things I need to remember. My mom and I are very similar. If we are hungry and we are still walking around a museum or a town, we sit down and refuse to budge until my dad or sister feed us. Hahahah. We are little brats, but hangry takes the best of us. I would love to read your suggestions for anyone traveling via car. I am terrified of planes. I dont know why, but I haven't stepped foot on a plane for 20 years! I love the adventure of driving and stopping along the way. I agree fully charged electronics and sanitizer is a must for any type of travel. I didn't know about the empty water bottle but that is a brilliant and most helpful. Being kind is the best tip, we think. It's not as practical as the others, but it does the most to ensure happy travels. Thanks for your tips! Let me add that we should bring extra plastic bag to store our trash, just in case we didnt see any trash can on the road. These are all great tips, but I think #4 and #10 are the only ones I had never heard before...and are important/great ideas! I've got like 4 trips tentatively planned for 2017 so I will def. be using this list! This is an excellent post. Don't forget to include a change of clothes in your carry on.